After two years, Pharaoh had weird dreams. In the first dream, Pharaoh was standing by the side of the river. Suddenly, seven fat cows arose from the water and went to eat grass in the meadow. Then seven skinny cows arose from the water and eat up the seven fat cows. In the second dream, Pharaoh dreamed that seven good grains sprung up from the field. But suddenly seven grain with thin heads arose from the field and eats up the seven good grains. After that, Pharaoh was very troubled. Pharaoh called every wise man in Egypt to interpret his dreams but no one can understand the meaning of Pharaoh’s dreams. The chief cupbearer remembered Joseph can interpret dreams. Pharaoh quickly sends for Joseph in the prison. Pharaoh told Joseph about his dreams. And Joseph said, “The seven fat cows and seven good grains means seven years of good harvest. Whereas the seven skinny cows and seven grain with thin heads means seven years of famine. The dream means that there will be seven years of good harvest and seven years of famine. You dreamed the same dream twice because God confirmed that it is going to happen. Pharaoh agreed with Joseph’s suggestion. 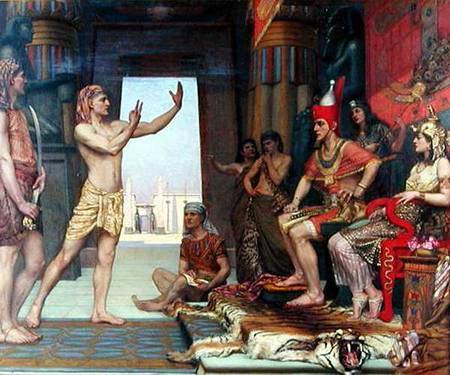 Pharaoh then appoints Joseph as governor of Egypt. Pharaoh also gives the Asenath, the daughter of the chief priest Poti-Pherah priest of On as wife. Pharaoh gives Joseph a new name called Zaphnath-Paneah. So Joseph started to collect one fifth of all the grains in Egypt and keep them in the storehouse. The grains were so much like the sands of the seashore. After the seven years of plenty, the seven years of famine came. The famine was so severe that there was no food in the land. So Joseph opened up the storehouse and started to sell the grains to the people.